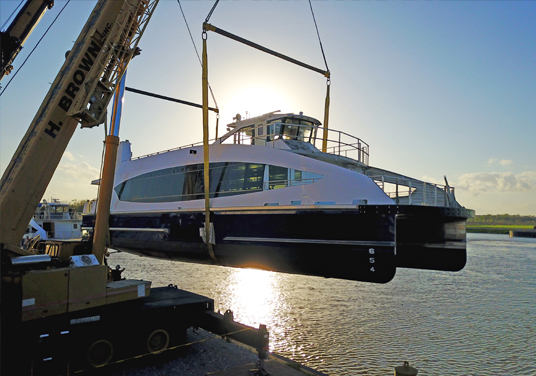 Best-known for the vessel fleets it produces for the U.S. Armed Forces and allies around the globe, Metal Shark has expanded its focus to include custom built passenger ferries and excursion vessels up to 250’ in length. With its vast engineering capability, mil-spec build processes, and considerable economies of scale, Metal Shark delivers precision vessels within tight production timeframes that few if any specialty yards can match. Metal Shark has now proven itself as a leading passenger vessel builder with a highly publicized track record of on-time deliveries. 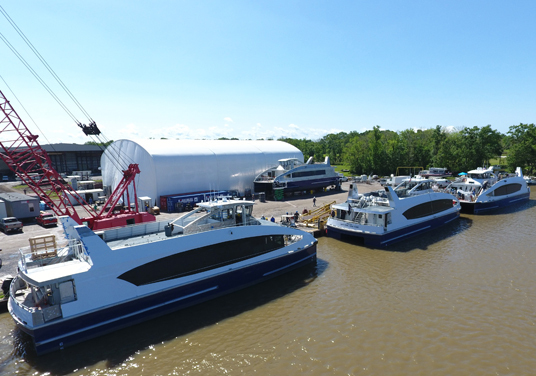 Between April and June of 2017, Metal Shark delivered six 88′, 150-passenger high speed ferries for the NYC Ferry system, with an unprecedented build time of less than ten months from start to finish. 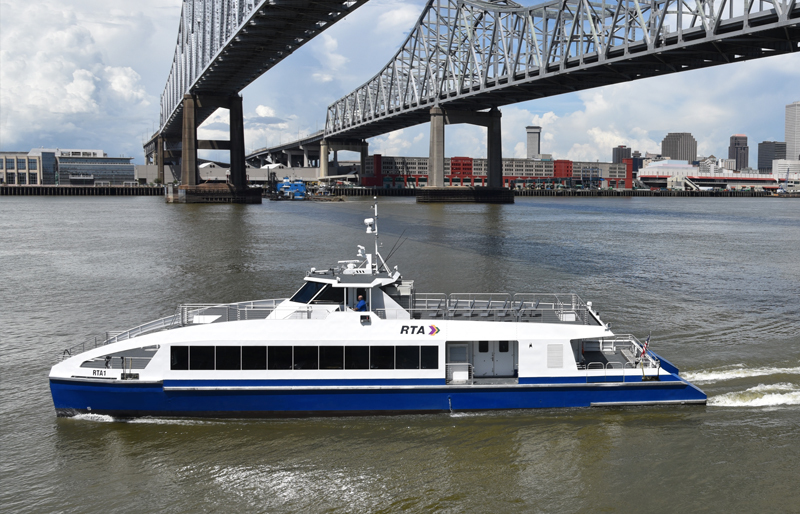 Metal Shark was also awarded contracts to produce four 88′, 150-passenger vessels for the Potomac Riverboat Company division of Entertainment Cruises, and two 105′ passenger ferries for the New Orleans Regional Transit Authority. 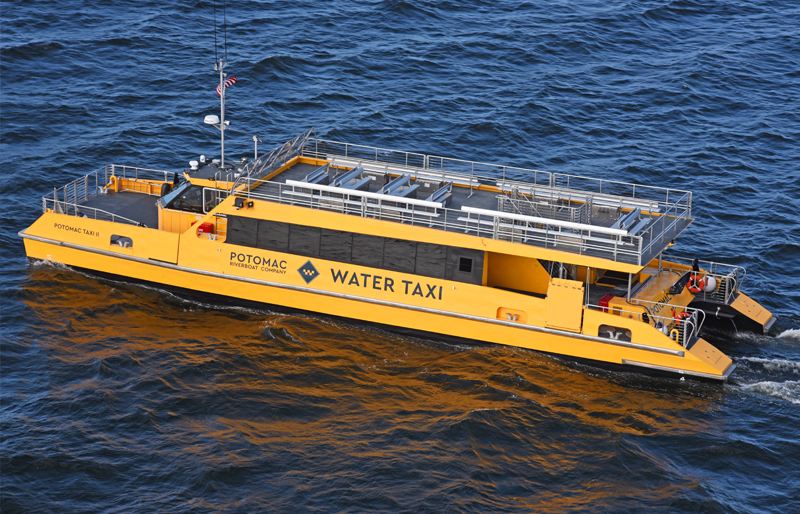 The first two Potomac Water Taxis were completed within an amazingly tight timeframe of approximately six months! Additional vessels were completed and delivered in 2017 and 2018. 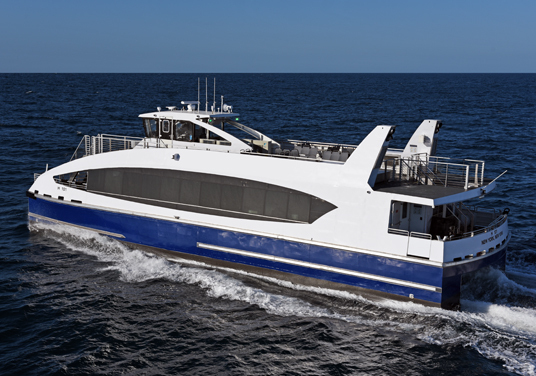 Still, ferry builds represent only part of Metal Shark’s passenger vessel success story. From whale-watching vessels to dinner boats, head boats, water taxis and more, Metal Shark is actively engaged with passenger vessel operators across a wide range of specialty markets. As a leading supplier of military vessel fleets that must be delivered within demanding timeframes, Metal Shark has established an engineering-centric approach that utilizes 100% digital design, cutting, and sheet metal bending for rapid and precise assembly. 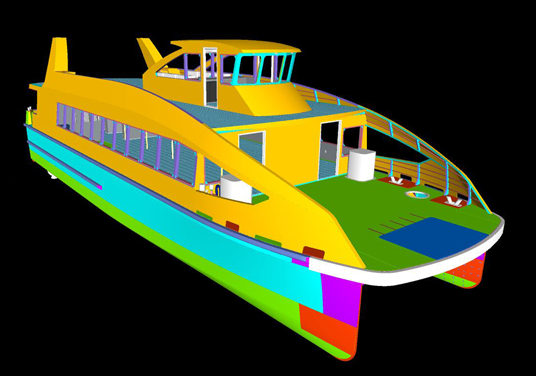 For each passenger vessel build, Metal Shark dedicates a team of project managers and project engineers to eliminate shop-floor engineering. Metal Shark enjoys unmatched economies of scale due to volume production, with multiple fleet builds underway at any given time, and leverages its strength to its customers’ advantage. Due to the diverse markets it serves, Metal Shark is never idle. Accordingly, there is no lag-time required to “ramp up” production. Instead, resources are allocated to each project as it is scheduled. Meanwhile, robust scheduling management tools assure on-time completion, even for the most demanding delivery timelines. Fully transparent QA systems developed in concert with US Navy and Coast Guard inspection teams yield “mil-spec” quality, and the extensive use of jigs and fixtures guarantee consistent, repeatable results within delivery timeframes that cannot be matched by many yards. Between April and June 2017, Metal Shark delivered six (6) 88′, 150-pax, passenger vessels to NYC Ferry, all on or ahead of schedule, with an industry-best production time of less than ten months per vessel. 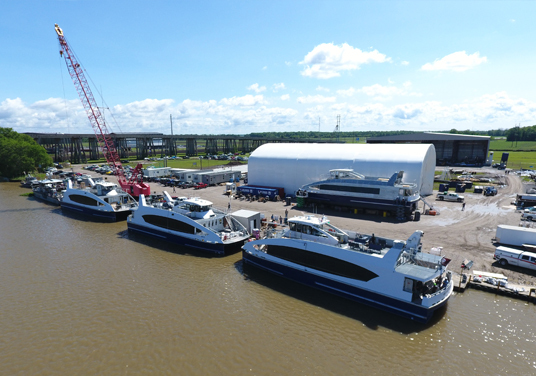 In September 2017, Metal Shark delivered the first two 88′, 150-pax passenger vessels of a four-vessel order to the Potomac Riverboat Company division of Entertainment Cruises. The vessels were handed off to the customer on time. 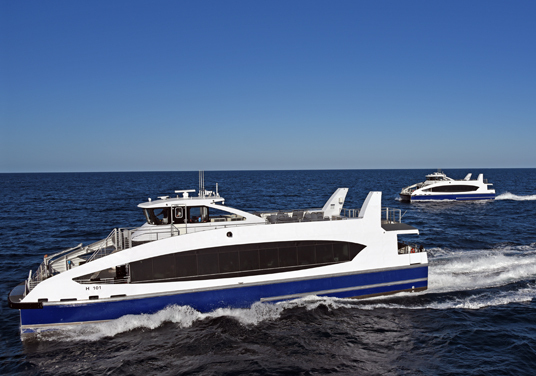 Since that time, Metal Shark has continued to deliver high quality passenger ferries to become the USA’s most prolific builder of passenger vessels, delivering over fourteen 150-passenger and 350-passenger ferries in 2017 and 2018 alone. Metal Shark has amassed engineering resources like no other comparably sized shipyard. With an in-house engineering team composed of over 35 naval architects and marine engineers, Metal Shark possesses the know-how and the bandwidth to create its own highly specialized and thoroughly engineered vessel designs to assure precision results. Metal Shark understands the economic realities and various environmental and regulatory challenges faced by passenger vessel operators and can assist with all of this by delivering fully customized vessel solutions. With its own portfolio of designs as well as those of other leading design firms, Metal Shark offers technologically advanced passenger vessels that are custom-tailored to meet exacting operator requirements. 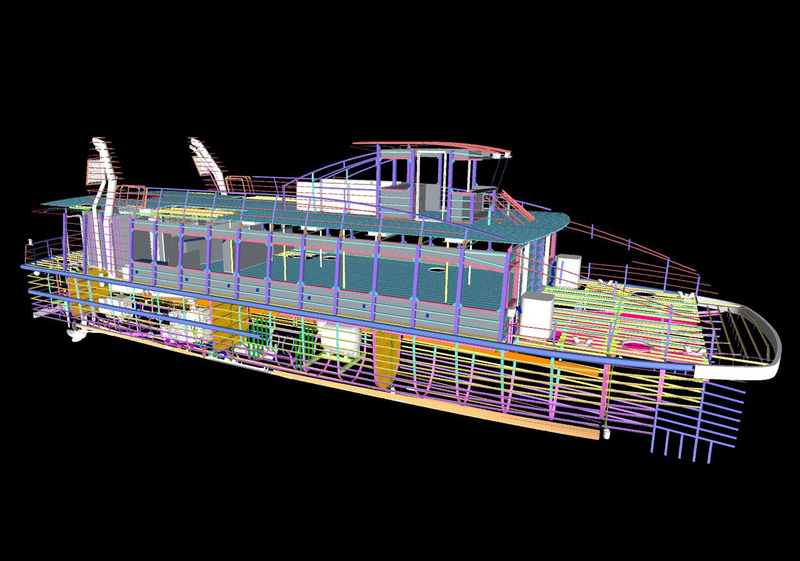 Metal Shark goes above and beyond, utilizing extensive 3D modeling to allow the project to be realized in advance, greatly facilitating planning and resource allocation, and executing an exact interpretation of each vessel’s design for precision, quality results. With the strength of its in-house engineering team and the proven track record of its production facilities, Metal Shark routinely partners with leading independent design firms and is adept at taking proven designs to the next level. Metal Shark has partnered with Incat Crowther to produce 88′, 150-passenger catamaran ferries for New York’s NYC Ferry System, and with BMT Designers and Planners to construct four 88,150-passenger ferries for Entertainment Cruises’ Potomac Riverboats division and also two 105′, 150-passenger ferries for the New Orleans Regional Transit Authority. Other notable Metal Shark design partners include Damen Shipyards, and One2Three design. Together with its global network of partner design firms, Metal Shark offers a portfolio of proven passenger vessel designs, offering the latest advancements in safety, operating economy, and environmental stewardship. 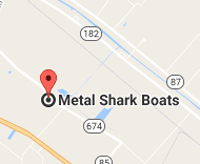 Metal Shark operates three shipbuilding facilities in Alabama and Louisiana. 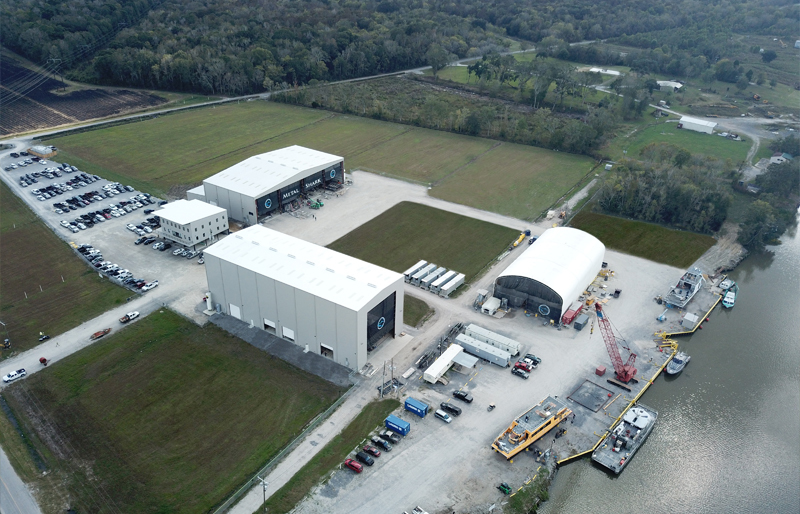 Primary passenger vessel assembly takes place at the company’s Franklin, LA shipyard, which is a 25-acre waterfront facility capable of supporting the production of aluminum, steel, and composite vessels up to 250’ in length. Currently, the facility boasts a 60,000 square foot assembly building with four assembly bays each equipped with overhead crane, with a substantial expansion project currently underway. The yard is also equipped with onsite engineering offices, wet slips, marine transporter, crane in/crane out capabilities, and ample drydock / outdoor storage capacity. Situated on the Charenton canal, Metal Shark’s Franklin yard offers direct unobstructed deep water access to the Gulf of Mexico. The yard is located immediately off Highway 90 for easy over-the-road transport of large components, and the site plan offers ample room for future growth. Learn more about Metal Shark’s Franklin shipyard. 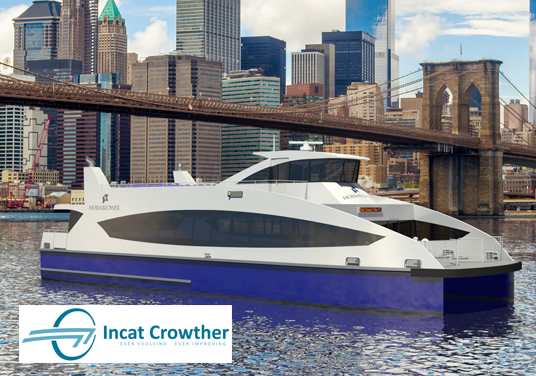 In July 2016, Metal Shark was selected by HNY Ferry Fleet, LLC (a Hornblower company) to build 88′, Incat Crowther-designed, 150-passenger high-speed ferries for its new NYC Ferry Service. By incorporating the same serialized building processes honed on its military fleet builds, Metal Shark built and delivered the entire six-vessel order in record time. With less than ten months’ time from project start to the delivery of the first vessel, Metal Shark delivered all six ferries on or ahead of schedule, between April and June, 2017. 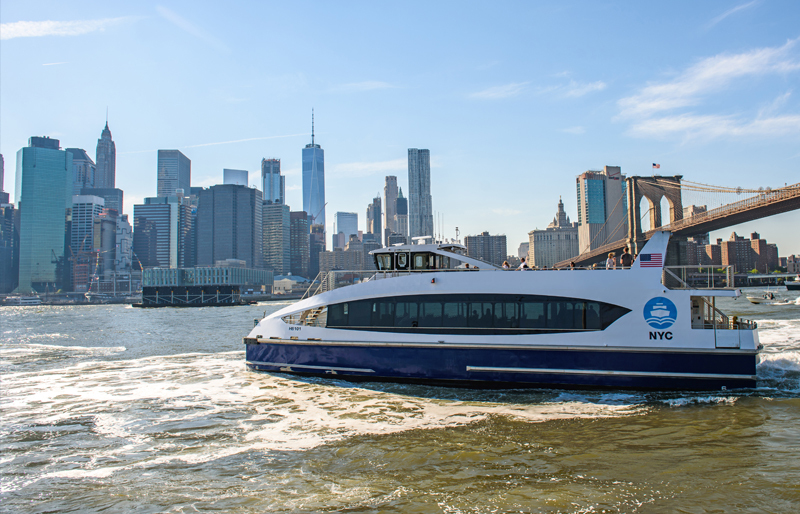 NYC Ferry officially launched on May 1, 2017, with Metal Shark-built H 102 given the honors of ferrying the first load of customers on the new service’s inaugural revenue trip. Metal Shark is proud to count HNY Ferry Fleet, Hornblower, and NYC Ferry among its growing list of satisfied customers. In September 2017, a second order of NYC Ferries was announced. 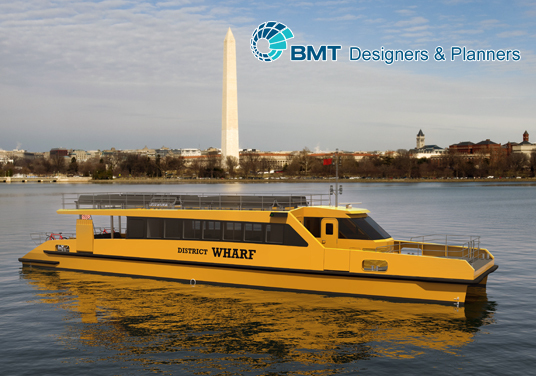 In January 2017, Metal Shark was selected by the Potomac Riverboat Company division of Entertainment Cruises to produce four 88’, high speed/low wake, 150-passenger aluminum catamarans for a new Washington DC transit service.The low-wake, low-wash USCG Subchapter T vessels were designed by BMT Designers and Planners and combine passenger comfort with fuel efficiency and low environmental impact. The new vessels provide commuters in the Washington DC metro region with service between Old Town Alexandria, Virginia; National Harbor, Maryland; and Georgetown and The Wharf in Washington DC. Potomac Riverboat Company parent Entertainment Cruises is the nation’s largest dining and sightseeing cruise company, with a fleet of 30 ships operating in over a dozen major U.S. cities. 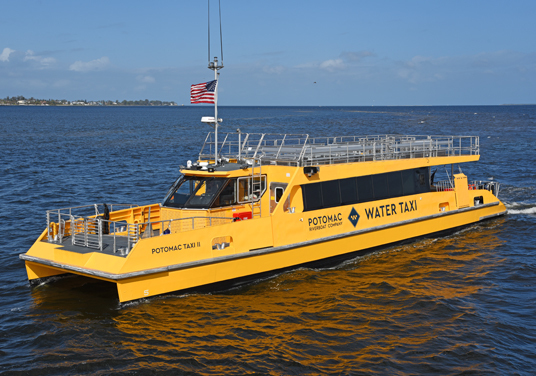 Construction on Potomac Taxi I and II commenced in March 2017, with both vessels finishing in September, approximately six months later. 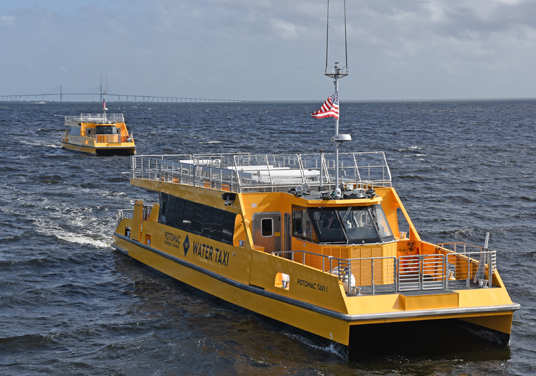 The remaining vessels, Potomac Taxi III and IV, were delivered in February and March 2018. Metal Shark is a proud member of the Passenger Vessel Association. You’ll find us at PVA events from coast to coast.